There is an amazingly strong community spirit in Telluride. In 2012, the ski company’s celebrated its 40th anniversary in Telluride, giving locals an opportunity to do a little reminiscing. In many ways, it’s amazing just how little this historic western outpost has changed. To this day, Telluride has retained the charm for which it’s famous. While a stop at the post office can take over an hour with all the socializing that happens there, skiers and snowboarders rarely wait in lift lines. Cowboys and artists still outnumber bankers and lawyers, and adventurers and entrepreneurs still make up the bulk of the town’s population. Despite its diversity, the community comes together whenever a resident needs help, in the true small-town tradition of old. Most Telluriders recognize how fortunate they are to be living in one of the truly special places on the planet – and are determined to make every effort to keep it that way. It is absolutely remarkable that 67% of the land in San Miguel County is open space — either national forest, state forest, or areas voluntarily designated as open space within town limits or subdivisions. Telluride, Mountain Village and San Miguel County have a long-term history of cooperating when it comes to conservation and managed growth. In order to conserve the natural beauty of this magnificent valley while developing a dynamic and attractive community full of recreational and cultural opportunities, there must be careful, balanced planning. Overly restrictive conservation measures could have curbed development to the point that Telluride would have remained a ghost-mining town into the next millennium. On the other hand, too much development could have turned the area into a mountain Disneyland. The magic balancing act was found in the form of a Comprehensive Development Plan for San Miguel County. Created in 1980 and modified every decade, the plan puts reasonable limits on development in Telluride, Mountain Village and the surrounding area. Two exemplary instances of conservation are the Idorado East-End Development and the nationally recognized condemnation effort of the Town of Telluride to condemn 550 acres on the Valley Floor, west of Telluride. Idorado East End: In the fall of 2001, the voters of Telluride rejected annexation of the Idorado Mining Company’s vast holdings east of town, including the east end of the valley and much land in the high basins. The feeling was that the development the mining company wanted to do in town on their Kentucky Placer parcel located near the entrance to Bear Creek, as a part of the annexation agreement, was just not acceptable. Valley Floor: The voters in summer 2002 also approved condemnation of the Valley Floor west of town (owned by the San Miguel Valley Corporation) in order to prevent its development. These two actions illustrate the commitment of Telluride residents to preserving open space both in and around the town and their determination to make the planning process their own. OPEN SPACES: According to the Telluride Master Plan, every piece of land available for development has a definite use designed for it, and all areas have designated open spaces spread throughout the county in order to keep natural habitats alive. Wetlands and forested areas are carefully protected, and in certain areas where development is permitted, restrictions allow wildlife to thrive. The town of Telluride itself has been designated by the government as a National Historic District. 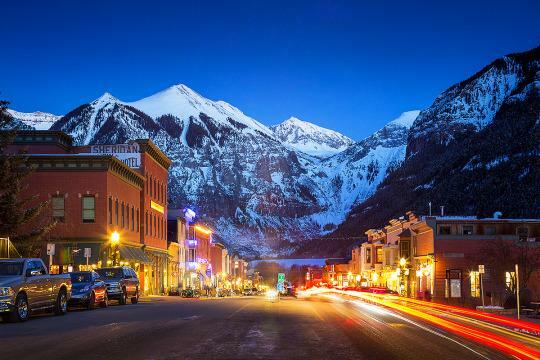 The Master Plan strives to help protect the heritage of Telluride as a once-thriving mining town by a set of strict guidelines on architectural design in the historic district. Any new structure must pass several architectural reviews before its construction in order to ensure its compliance with these guidelines. Another brilliant innovation in Telluride’s Master Plan is the concept of deed-restricted property to help provide good affordable housing for the work force. Employee housing has always been a major problem for expensive ski resort communities, but through the Master Plan the Telluride region has addressed this problem effectively. The San Miguel Regional Housing Authority manages 134 employee units at the Shandoka Project (housing approx. 257 residents). It also qualifies renters for employee designated units owned by private individuals and administers the deed-restricted housing program in the town and the county. Mountain Village has addressed this problem as well with 149 employee units at Big Billies (housing approx. 149 residents) and 221 employee units at Village Court(housing approx. 400 residents). Both apartment complexes are within town limits. In retrospect, Telluride has benefited greatly from studying its predecessors’ mistakes, and using the lessons learned to plan properly for its future.